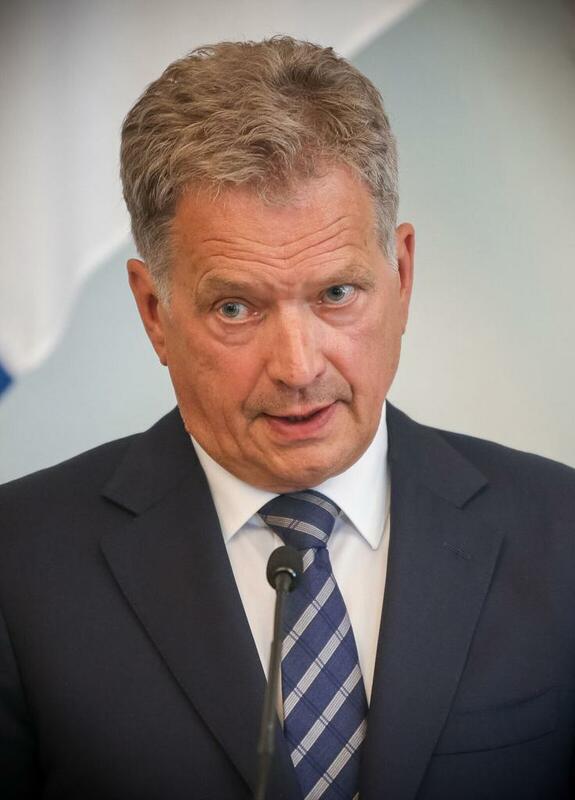 Sauli Väinämö Niinistö, the 12th President of the Republic of Finland, was inaugurated on 1 March 2012. Sauli Niinistö was born in Salo on 24 August 1948 and graduated from the University of Turku with a Bachelor of Laws degree in 1974. He served as a rural police chief and as an assistant judge at the Turku Court of Appeal. He practiced law as an attorney and gained experience of corporate administration. He was elected to the Town Council of Salo in 1977 and continued to hold elected posts in local government until the 1990s. Sauli Niinistö was first elected to Parliament in 1987. In 1995, he was appointed Minister of Justice and Deputy Prime Minister in the Government of Prime Minister Paavo Lipponen. He was appointed Minister of Finance in 1996, when the aftermath of the 1990s recession was at its worst, and unemployment was at record high levels. Those difficulties were overcome, however, and Finland entered the new millennium with a robust economy. In 2003, Sauli Niinistö took up the post of Vice President of the European Investment Bank in Luxembourg. His purview included R&D funding and funding activities in the Nordic countries and Russia, and he was also chairman of the Northern Dimension Partnership Programme. He has also been a Member and Chairman of the Board of Governors of the European Bank for Reconstruction and Development (EBRD) and a Member of the International Monetary and Financial Committee (IMFC). Sauli Niinistö returned to the Finnish Parliament in the 2007 election with the highest number of votes ever gained by a candidate. He was Speaker of Parliament from 2007 to 2011. President Niinistö is married to Jenni Haukio and has two adult sons from his previous marriage. President Niinistö is active in sports and was also Chairman of the Finnish Football Association from 2009 to 2012 and Chairman of the organising committee for the 2009 European Figure Skating Championships. He has written two books.